Beautiful Blue Eyes is written and illustrated by Marianne Richmond. who sings in her tree." This book engages a child's eyes and explains to them that their eyes are the window to their souls. Eyes can tell you more than words if you pay attention to their focus. They can tell you if your sad, happy, angry, mad, worried and so much more. Eyes look outside but people see in and each of us has our own set of eyes to be proud about. Marianne Richmond's beautifully illustrated book is sure to be a bedtime favourite for you and your child. As Marianne patiently awaits her daughters eye colour to appear, she marvels at their wonder and appreciates their value. 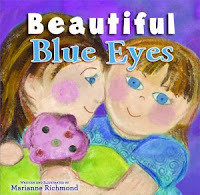 Beautiful Blue Eyes is the follow-up book to Beautiful Brown Eyes, Marianne calls each of her children by their eye colour, even the dog has his colour, giving her a line of books that are sure to endear her readers to their imagination. I really enjoyed the beautiful oil on canvas type of illustrations, they were colourful and engaging to myself and my wee folks. With emphasis on certain words, giving more meaning to the prose you are sharing with your children, it helps to create sight words with your child's early reading techniques. The rhyming prose was filled with love and gives the reader/listener a feel good moment about themselves. With much emphasis on each persons unique abilities and how our eyes tell us things about ourselves, even those things we try to hide, we are told a story about believing in yourself and the special person that you are. A child's eyes truly tell wonders, revealing personality, thoughts and feelings of the heart. Beautiful Blue Eyes, a sweet story with engaging illustrations, celebrates the unique spirit of the blue-eyed boy or girl.